A draft Security Council resolution to authorise deploying a joint UN-African Union peacekeeping force in Sudan's Darfur region has run into opposition. UN Secretary-General Ban Ki-moon called for it to be approved quickly, but key nations object to a sanctions threat. Meanwhile, talks in Libya on the four-year conflict have made progress towards setting up future peace talks. A small AU force has failed to halt the violence, which the UN says has led to some 200,000 deaths and 2m displaced. Sudan's UN ambassador Abdalmahmood Abdalhaleem Mohamad said the draft UN resolution should be more Sudan-friendly and drop "irrelevant and alien issues" like the threat of sanctions. Ambassador Dumisani Kumalo of South Africa, a member of the Security Council, warned that any talk of sanctions in the draft was "totally unacceptable". Last month, the Sudanese government agreed to allow the hybrid force into the region after months of pressure from the international community. Following the two-day talks in Tripoli, the UN and AU have asked the rebel factions that did not sign a failed 2006 peace deal to attend talks in Tanzania early in August. Mr Ban said the goal of the talks was to get all the key rebel groups, tribal leaders and the government around the negotiating table by September. He has also urged the Security Council to pass the draft resolution this week to get the 24,000-strong hybrid on the ground speedily. UN reports say security on the ground is deteriorating, pointing to the rise in attacks on aid workers and AU peacekeepers in Darfur. "The resolution calls on member states to finalise their contributions within 90 days. I think this is fast by UN standards but I want to move more rapidly," said Mr Ban. "The political situation on the ground is too fragile, the humanitarian crisis too dire, to waste more precious time." 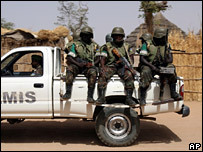 Mr Ban said he has been told the first international troops could be sent to Darfur by October. "I'll push for September," he told reporters. He did not refer to the opposition to the draft resolution.